Ceiling Fan vs Stand Fan: Which Is Right for You? As the weather heats up, it’s time to choose the perfect fan for your home. Read on as we discuss the pros and cons of a ceiling fan vs stand fan. There’s just something special about summer. Summer is a time to relax and enjoy time with friends and family. The extended daylight, picnics, and trips to the beach all conspire to make summer exciting. That said, summer also brings high humidity and rising temperatures. While the warm weather can make it nice to be outside, it can also make your home feel like an oven. We’ve all had sleepless summer nights where we just couldn’t get relief from the heat. This is where a fan can help beat the heat. In general, fans come in two main categories: ceiling fans and stand fans. One type is not necessarily better than the other. Rather, finding the right fan for you depends on your particular needs and preferences. So how can you decide between a ceiling fan vs stand fan? Let’s look at the pros and cons. Of course, air conditioning systems can help cool you down. But blasting the air conditioning gets expensive, and it’s not energy efficient. Not only that, but the cool air also tends to stay in one place, rather than circulating the room. Also, with air conditioning, the cool air also tends to stay in one place. Without air circulation, it’s hard for the room to get cool. Using fans throughout your home will help move the cool air throughout the rooms. This will cost you less money than cranking the AC would and will be better for your carbon footprint. But not all fans are created equal. In the ceiling fan vs stand fan debate, there are definitely benefits and drawbacks to both. Let’s start the ceiling fan vs stand fan discussion by looking at the benefits of a ceiling fan. Here are some factors to consider. When it comes to appearance, ceiling fans are the clear winner. They provide a more permanent and intentional look than a standing fan does. Additionally, ceiling fans also come in a lot of varieties, so you can find one that fits your preferences. For instance, you can choose a fan with wooden blades that match the furniture in the room. Or, you could choose a fan with metal blades. Another great aesthetic feature of ceiling fans is that they usually include a light fixture. This way, you can provide light to the whole room while also cooling it down. Ceiling fans are also superior when it comes to larger spaces. For one, ceiling fans are usually installed in the center of the ceiling. This central location in the room gives the fan a better vantage point from which to circulate air. 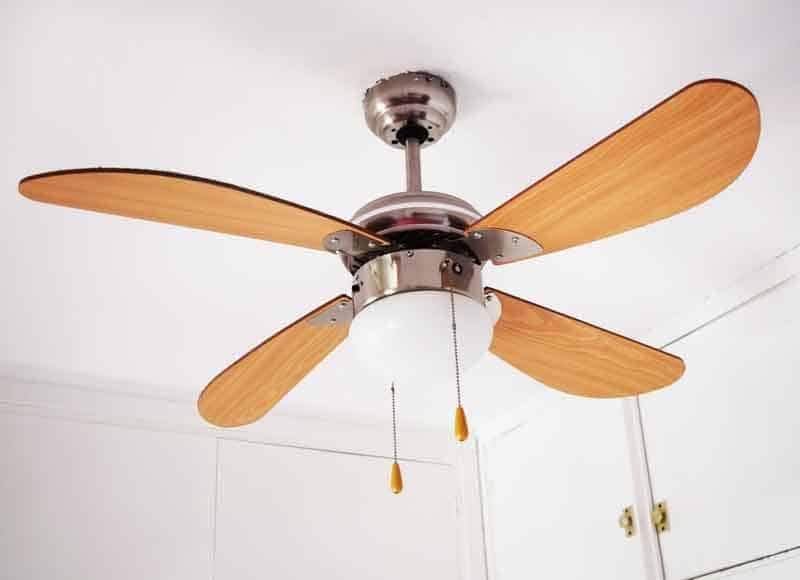 Additionally, the blades for a ceiling fan are much longer than a standing fan’s blades which helps ceiling fans to move air more effectively than standing fans do. Another factor to consider when deciding between a ceiling fan vs stand fan is space. Since a ceiling fan, by definition, goes on your ceiling, that means it doesn’t take up any floor space. This makes it less clunky than a standing fan, which occupies space in the room. This also makes ceiling fans safer if you have children or pets. They can’t reach the fan, and they won’t have any wires or cords to trip over. There are a number of ceiling fan options that have the ability to integrated into your Smart Home, or as a stand-alone, mobile controlled unit. This can give you much more control over your room temperature, especially when you are out and about. While there are many benefits to ceiling fans, that’s not the end of the ceiling fan vs stand fan debate. There are a couple aspects of ceiling fans that can make them less appealing. Perhaps the most difficult aspect of ceiling fans is that they require installation. If you’re handy, you might be able to figure out the process yourself. That said, the installation does require working with electrical wiring. If you’re uncertain about doing it yourself, it’s best to hire a professional to avoid injuries. Also, the need for injury can also be a hurdle for renters. In some situations, your landlord might not even allow you to install a fan. Even if you can install it, though, you’ll have to uninstall it when you leave. Another barrier with ceiling fans is the price. While the prices range, ceiling fans are generally more expensive than standing fans. And that doesn’t include the price of installation. Also, once you install a ceiling fan, it basically stays where it is. You can’t move it to another room or reposition it. Finally, there are some spaces that ceiling fans just don’t work in. If your home has low ceilings, then a ceiling fan could quickly become annoying. Or, even if you don’t have low ceilings, ceiling fans can be frustrating for tall people. The key is figuring out what’s right for your home and your needs. So, given some of the drawbacks of ceiling fans, let’s consider the how stand fans weigh in on the ceiling fan vs stand fan debate. As we’ve already mentioned, ceiling fans require installation. A ceiling fan, however, simply needs to be assembled, and plugged in. This makes ceiling fans a great option for renters. Additionally, if you’re not sure whether a ceiling fan would work in your room, a stand fan makes a good alternative. While ceiling fans may be preferable for large spaces, stand fans work better for providing a steady stream of cool air. Because they are easy to move around, you can put a standing fan right next to where you are sitting or sleeping. This will cool you down much more than a ceiling fan would. Standing fans are far more portable and can move around from room to room to help you cool. Obviously, this is not the case with ceiling fans. It wouldn’t be a fair discussion of the ceiling fan vs stand fan question if we didn’t consider the problems with standing fans. Here are a couple of reasons a stand fan might not work for you. We’ve all heard the saying, “you get what you pay for.” This can definitely be the case with standing fans. Many standing fans, especially the cheaper ones, burn out quickly. After one hot summer, you’ll start to notice the blades not moving as fast as they used to. That said, some standing fans come with extended warranties. If you purchase one of these fans, you’ll be protected if it burns out. Most standing fans are made of plastic material. Having a plastic fan in the corner of your room with a variety of wires attached to it just doesn’t look sophisticated. That said, standing fan manufacturers are aware of this issue and have made an effort to address it. Some standing fans feature wood paneling to make it fit in better with the rest of your furniture. Additionally, sleek tower fans look much better than pedestal fans and can fit into smaller spaces. At the same time, pedestal fans feature larger blades, so you might be better off with one of these in a larger room. This opens up another debate about Tower fans vs Pedestal fans. 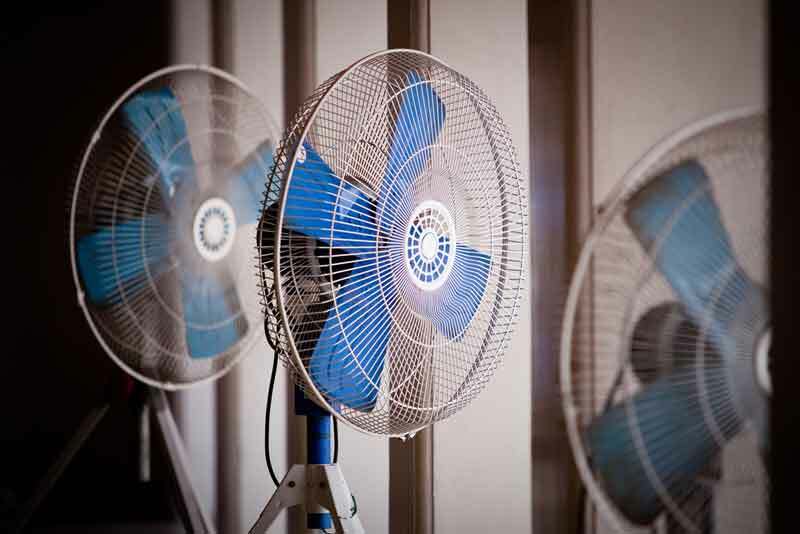 While all fans generate some noise, standing fans and pedestal fans tend to create more noise than ceiling fans. This can be hard to get used to if you’re using the fan to cool down your bedroom. We’ve taken a close look at both sides of the ceiling fan vs stand fan question. So what is our final verdict? On the one hand, ceiling fans look more intentional and can cool a larger room. On the other hand, ceiling fans are a commitment and can be tricky to install. With a stand fan, you have versatility. You can move it around your home, and more it closer or farther from you. At the same time, stand fans don’t look as refined, and can often be noisy and cumbersome. So what is our final verdict? As we said at the beginning of the article, it depends. If you are a renter, it is almost always better to go with a standing fan. This way, you don’t have to get permission to place it in your home. Also, you don’t have to worry about either uninstalling the fan or losing money on it. If you’re a homeowner, however, you may want to consider a ceiling fan. Especially if you’re trying to cool a large room, a ceiling fan can be a more long-term decision. Many homeowners opt to use a combination of ceiling fans and stand fans, depending on the needs of the room. For instance, a standing fan can be a good choice in a room with a low ceiling. It can also work well in a room that doesn’t have the right wiring. Tower Fan vs Box Fan Pros & Cons (Complete Guide): Which is better?